A friend told me this summer that her husband was teaching stand up paddle boarding (SUP), which I’d never heard of. So I asked Mark to write a few words about this sport. He then explained that paddle board yoga is catching on even faster…relaxed meditation and postures on the water, listening to the birds, watching the clouds and sky. Also requiring more core muscles to keep your balance on this wider-than-a-surfboard board. Ready to give it a try? Stand up paddle boarding is currently the fastest growing water sport in the world. 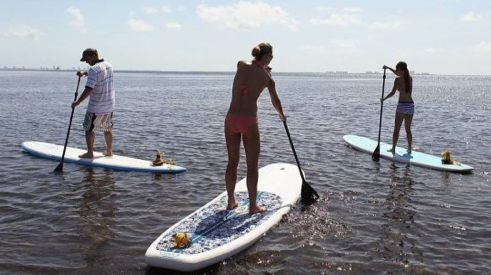 Stand up paddle boarding has a wide variety of variations which include surfing, white-water river, racing (flat water and white water), recreational, touring, fitness, fishing and yoga. It has attracted a wide variety of people because it accommodates all ages and skill levels. 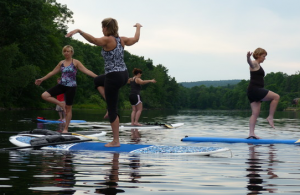 Paddle board yoga has recently become the new “in” sport. 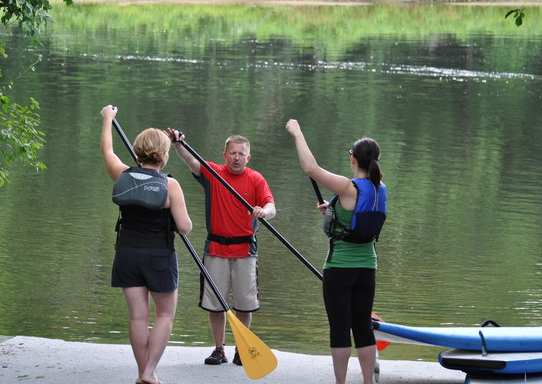 This season I started with teaching one lesson per week on the Farmington River near Collinsville, Connecticut. We ended the season with four filled to capacity. 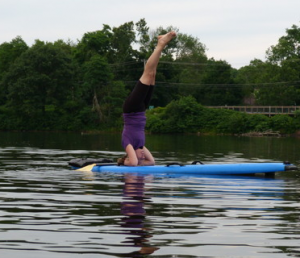 The lessons attracted novice to advance yoga students with most having no previous paddle board experience. The first half-hour of the lesson includes safety, basic strokes, proper paddleboard stance, mounting and dismounting the board. We would then paddle up the river practicing these techniques. You are currently browsing the archives for the paddleboarding category.